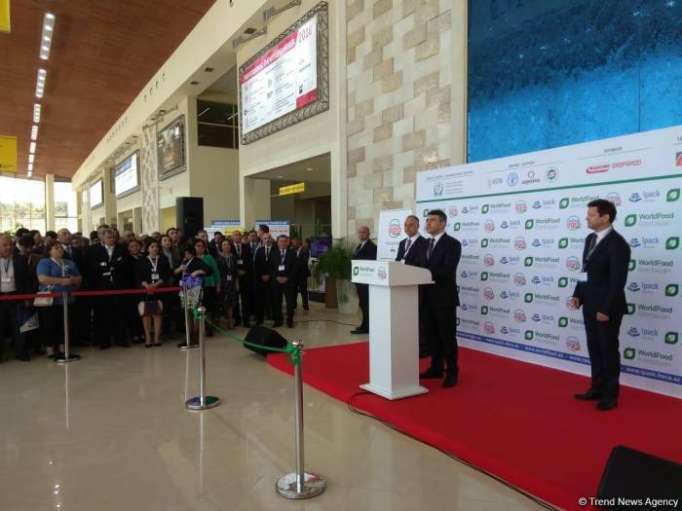 Azerbaijan’s agriculture sector has reached a new level of development thanks to the reforms carried out in the country, Agriculture Minister Inam Karimov said at the opening of WorldFood Azerbaijan, Caspian Agro and IpackCaspian exhibitions in Baku on May 16. "Significant success in the field of agricultural development has been achieved as a result of the growth of socio-economic indicators in this sector. It is encouraging that the competitiveness of goods produced in Azerbaijan is growing, and the export potential is expanding," Karimov said. The minister further said that priority areas for the agriculture development are provision of high yields, increasing the competitiveness of local products, and ensuring food security. "The main principles of work are proximity to farmers and application of the innovations," the minister noted. WorldFood Azerbaijan 2018, the 24th Azerbaijan International Food Industry exhibition, has today kicked off at Baku Expo Center. The organizers of the three-day event are Iteca Caspian and ITE Group. The exhibitors from more than 20 countries, including Belarus, Latvia, Greece, Turkey, Sri Lanka and Italy, take part in the event. The business program of the exhibition also stipulates holding of bilateral meetings, in which food suppliers and representatives of local retail chains will take part. A "showcase of novelties" will be organized at the exhibition for the first time. The participants will demonstrate their new products, not yet available on the market. Caspian International Packaging, Tare, Label and Printing IPACK Caspian 2018 exhibition take place alongside WorldFood Azerbaijan. The Ipack Caspian 2018 exhibitors include a number of companies from many other countries.